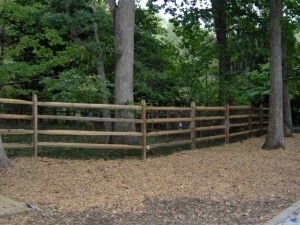 Fence repair is an inevitable part of the life of many fences. There are a variety of reasons why your fence might need to be repaired. You might accidentally back into the fence with your car in the driveway. A storm could bring a limb down on your fence. Growth of vegetation can overtake fences and weaken their structural integrity. Animals can dig under fences and tear up chain links. An old fence may simply have seen too much abuse from the elements over the years. Aesthetic issues such as chipping paint can be a problem as well. While painting your fence is one thing, replacing a section that got hit by a car or tree limb is another story. For moderate to major fence repair in Richmond, you need a fence company that has plenty of experience installing and repairing all kinds of fences. Hercules Fence has been in the fence business for more than 50 years installing and maintaining residential, commercial, and industrial fences of all kinds. From traditional wood fences to high-tech high security fencing, we’ve never met a fence we couldn’t fix. From small cosmetic fixes to replacing posts and entire sections of fence, Hercules can get your fence looking like it did before that bumper backed up a little too far or that old limb finally gave way. For all of your fence repair needs in Richmond, you can trust Hercules Fence of Richmond. This entry was posted on Thursday, June 26th, 2014 at 8:58 pm. Both comments and pings are currently closed.